Cabasse returned to the UK a year ago, after an absence of several years. The complete range of available models is huge, partly because it mixes stereo pairs with multichannel extras and is arranged in a three tier hierarchy, dubbed Oceo, Idea and Artis. The MC40 Java we are reviewing here is part of the Oceo range. The Oceos begin with the conventional MC20s, but this MC40 Java is one step up the Oceo ladder and the MC40s use Cabasse's own distinctive variation on the co-axial drive unit theme. Its ultimate expression (La Sphère) has no fewer than four different independent driver sections mounted co-axially on the same chassis, but here the technique is just applied to the midrand and treble drivers, operating above 900Hz in this three-way design, while frequencies below that crossover point are handled by two 170mm bass drivers and a downward-firing port. The co-axial unit is particularly unusual in having an annular ('ring doughnut') shaped diaphragm, surrounding a tiny (15mm) horn-loaded dome tweeter. The annulus has an outside diameter of 82mm, while the twin drivers operating through the bass and lower midband both have 120mm diameter diaphragms. There's a proper plinth, but the spikes – cones are a more appropriate description – are more decorative than functional. They're quite big, but hardly sharp enough to guarantee penetrating a carpet and are only locked by a serrated edge wheel the same size as the cone base, which is, therefore, hard to tighten. The woodprint finish, in either cherry or purple cherry, looks better than most, while both sides have a mild convex curve. As one might anticipate from its very distinctive driver technology, the Cabasse model sounds rather different from its French rivals. 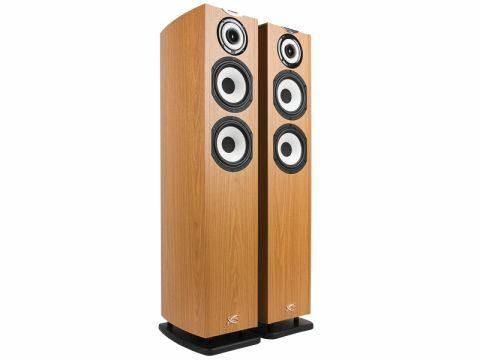 The generous port-loaded bass driver line-up clearly indicates the speaker should be sited well clear of walls and this is confirmed by the in-room measurements. The Java's most salient sonic feature is its smooth neutrality, right across the board. The sound quality is, above all, very easy on the ears and will be very easy to live with too, though some might find it a little too restrained for personal taste. While the bass and midband are beautifully integrated, the top end does err on the cautious side and the shallow depression around the high mid-to-treble crossover region may well account for a mild lack of bite and brio. The bass drives things along purposefully, with plenty of weight and scale, while the stereo images further up the band are well formed with good spaciousness. Dynamic range is very good, though dynamics themselves seem a little understated. Coloration is pretty well controlled, though not without a little midband boxiness, and there's room for a little more tension and transparency here, but its essentially vice-free behaviour singles it out from the pack.